Halton Gill Bunk Barn is situated at the head of Littondale, the quietest and most beautiful of the Yorkshire Dales in the centre of the National Park. 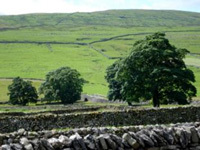 It lies at the foot of Pen-y-ghent, one of the famous Three Peaks, near the Pennine Way and the Dales Way, and the area is criss-crossed by a number of public footpaths and cycle routes. There is climbing and pot-holing locally, and fishing and pony trekking at Kilnsey, as well as mountain biking, and a full range of outdoor activities in the area. A centre close to the barn also offers laser combat, rally karts and rope courses. The Bunk Barn sleeps 40 people in 8 separate bedrooms. There is a large, efficient drying room, playfield games and equipment and a Finnish Sauna. There are 8 fully carpeted bedrooms as well as a self-contained leader's room with its own kitchenette, toilet and separate entrance. There are separate ladies and gents facilities with 2 toilets, 2 showers and 4 washbasins each and a large common room with a pool table, ping-pong top and ample seating. 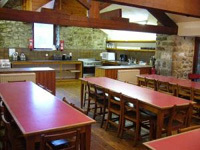 The larger kitchen-dining room comfortably seats 40 and is very well equipped with 2 range cookers and 4 fridges. The Bunkbarn is just outside the village so is safe, quiet and private, and is open all year round. It is warm, welcoming and spacious, with oil-fired central heating, ample parking and a well-maintained one acre playfield.